Se faire un cinéma | One quality, the finest. 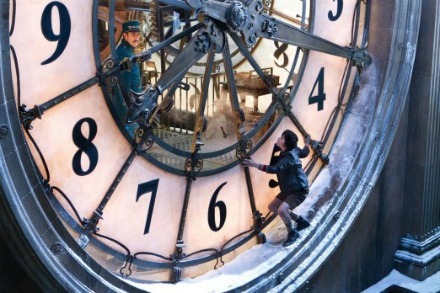 I highly recommend that you go to see Hugo, directed by Martin Scorsese. It’s based on a children’s book named The Invention of Hugo Cabret, by Brian Selznick. Without spoiling the plot for you, it’s a story about an orphan in Paris in the early 30s who lives in the walls of a train station. He maintains the station clocks and is restoring an automaton, which leads him to friendships and happiness. The animation is beautiful and the plot is heart-warming. There are several references to France’s role in early cinematography, including the Lumière brothers. There’s even rare footage of the earliest movies. One of the messages of this film is that movies are the manifestation of our dreams. Today’s expression, se faire un cinéma (suh fair uhn sin-ay-mah), means “to make oneself a movie.” You use it in situations where people are imagining things the way they would like them to be. The movies are a great way to do that. Give it a try with Hugo. This entry was posted in Movies and tagged Auguste Marie Louis Nicolas Lumière, Brian Selznick, Hugo, Jean Louis Lumière, Martin Scorsese, The Invention of Hugo Cabret. Bookmark the permalink. Pingback: Jamais deux sans trois | One quality, the finest. Pingback: Forain | One quality, the finest.